A series of reports from The Pew Charitable Trusts that focuses on access to the ballot box said Kentucky lawmakers are showing increased interest in reforming state elections. Scott Greenberger is the executive editor of Stateline, a journalistic project at Pew. He said some lawmakers in the commonwealth are following national trends on issues such as when citizens can cast their ballots. “So for example in Kentucky legislators have already introduced legislation to establish early voting which is not available in most parts of the state. 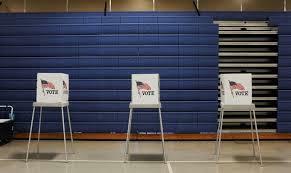 Election day registration and pre-registration,” Greenberger said. The State of the State’s series points to early voting and election day registration bills introduced in the Kentucky legislature as examples of the state’s interest in voting reform. Some state lawmakers have also expressed support for changing the Kentucky constitution to restore voting rights for felons once they’ve finished serving their sentence. Greenberger said the issue of election security has risen to the top of many Democratic lawmakers’ agendas following accusations of voter suppression in several states during the recent midterm elections. “For a long time people involved in these issues, advocates and researchers sort of lamented the fact that it was hard to get people interested in these sorts of technical election related issues,” he said. Greenberger said Democrats often benefit politically when more people vote or when turnout is high. The Kentucky legislature passed a law in 2016 allowing people with certain class D felony convictions to clear their criminal records if they’ve stayed out of trouble for five years. Should Kentucky Elections Be Held During Presidential Years? If approved, the proposal would extend the terms of Kentucky’s next governor and other constitutional officeholders by one year, giving the elected officials five-year stints. Elections for Kentucky’s constitutional officers are now held during odd-numbered years. Rep. Kenny Imes, a Republican from Murray, said he proposed the bill to save counties money on elections and break up the nearly constant barrage of elections in Kentucky.